Who is it for? Hask Keratin Protein Smoothing Deep Conditioner is a deep conditioner, which is ultra restorative, moisturizing hair conditioner that leaves all hair types smooth, shiny and frizz free. The special ingredient blend repairs damage reduces breakage and helps reduce static and drying time. Perfect for over-processed and color treated hair. Free of sulfates, phthalates, gluten, drying alcohol and artificial colors. Apply a generous amount of deep conditioner to clean, wet hair. Massage into hair focusing on damaged areas. Leave on for 10 minutes. Rinse well. Can be used once or twice in a week. 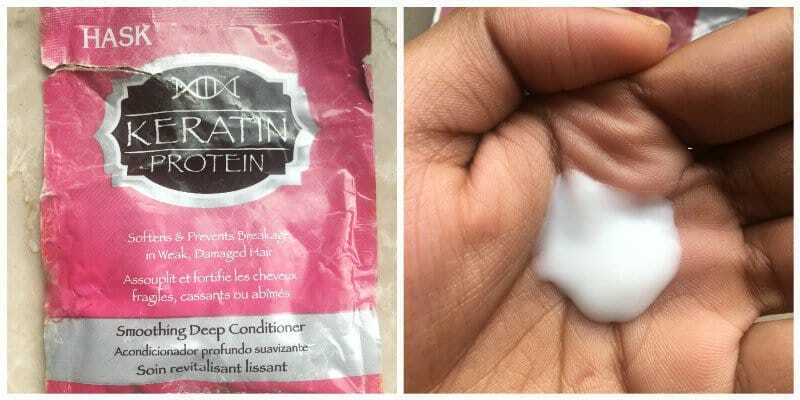 This conditioner comes in a pouch, which is good for 3-4 times use. The pouch is easy to open and travels friendly. This also comes in a big bottle but one can always try the product before investing in a big 200ml bottle. The conditioner smells good and is not too overpowering. My hair was feeling dehydrated and needed some extra love. I got this as a deep conditioner and I really liked the result. From the first wash, my hair was silky and smooth to touch and untangling the tangles became easier. I washed my hair and put it on for a good 15 minutes and I was pleased with the results. That extra boost of protein did wonders to my hair. And I have been using this product once in a week or two weeks since then. Sulfate, phosphate, and paraben free. Suitable for all kind of hair even color-treated hair. It did add shine to my hair. A small pouch lasts for a 3-4 wash. Yes, I will totally recommend this. Is Baking Soda Good for Skin ?